Kalachandji’s and the Crow Museum of Asian Art of the University of Texas at Dallas will present the second-annual Festival of Joy March 30, from 11 a.m.-6 p.m. at Klyde Warren Park.Last year’s inaugural festival drew thousands to experienced the bold colors, beautiful flowers, authentic cuisine, music, dance and interactive cultural exhibits. This year’s event is free and open to the public, kicking off Dallas Arts Month. The Festival of Joy will begin at 11 a.m. with a parade traveling through the Dallas Arts District and ending at Klyde Warren Park. 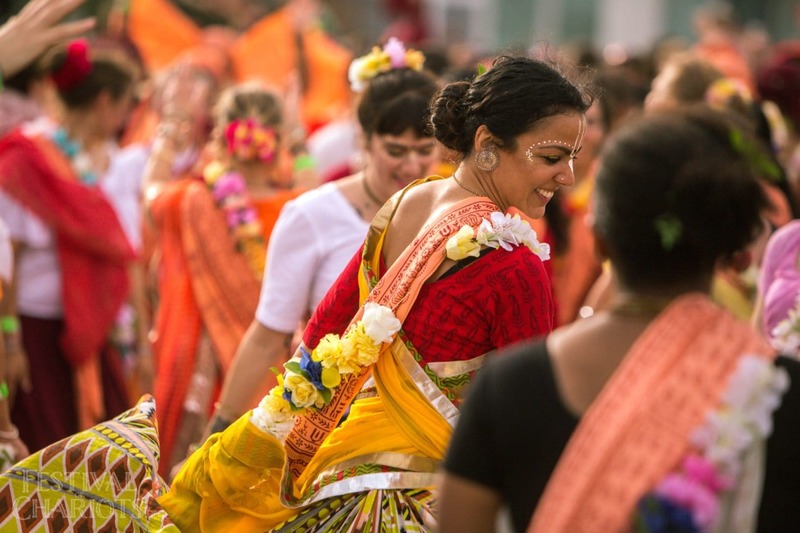 The parade will involve hundreds of festival-goers, pilgrims and faith leaders who will hand-pull the colorful chariot carrying the sacred deities of Jagannatha, Subhadra and Balarama along Flora Street to Klyde Warren Park. Next to the chariot, hundreds more will dance while singing sacred mantras and playing traditional musical instruments. 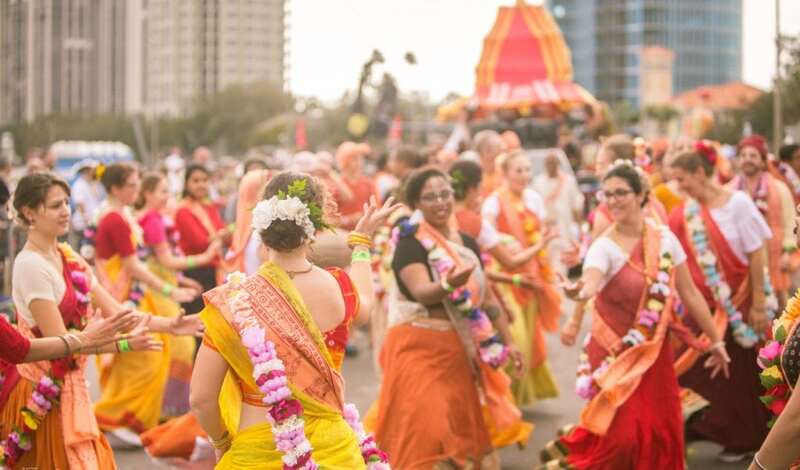 After the procession ends at Klyde Warren Park, families and guests can enjoy cultural and educational exhibits that reveal the spiritual heart of India. 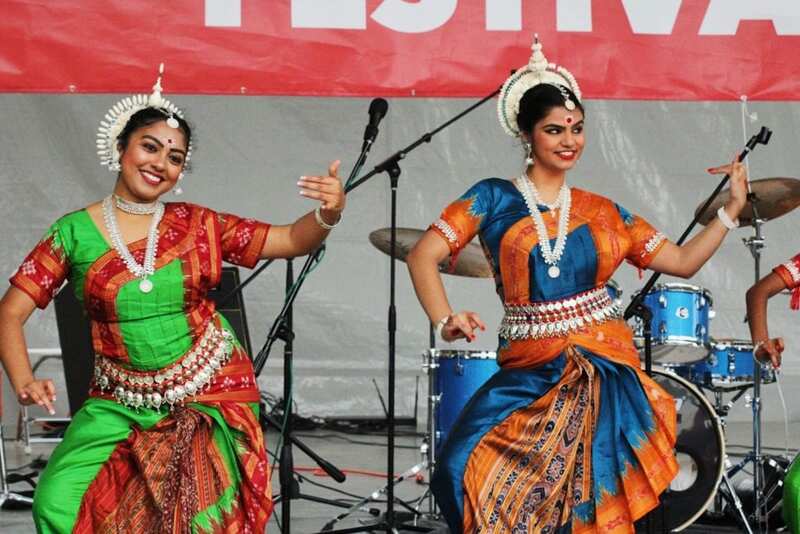 The park will feature a main stage with kirtan (musical mantra meditation) and bharat-natyam (classical Indian dance), plus booths featuring traditional crafts, vegetarian cooking demonstrations, cultural displays, Indian dress-up (try on a sari or turban), face painting, mehendi (henna tattoos) and more. A free vegetarian feast will be served to all, and varieties of ethnic vegetarian food will be available for purchase. “Although last year’s weather was frigid, we had a wonderful crowd that embraced the Festival of Joy, including Dallas Mayor Mike Rawlings. We are excited to join other major cities in presenting this ancient celebration and sharing the magical culture of India with North Texans,” said Nityananda Dasa Adhikari, president of the Radha Kalachandji Temple. The Festival of Joy – also celebrated as the Festival of Chariots, or Ratha Yatra – has its roots in ancient India and the bhakti tradition. It’s celebrated in major cities all across the world, including New York City’s Fifth Avenue and London’s Piccadilly Circus. It has been observed annually for more than 3,000 years in the ancient holy city of Jagannatha Puri in Orissa, India, making it the oldest street festival in the world. Devotees believe that if they get the honor of pulling the ropes of the giant chariot carrying Lord Krishna, known as Jagannatha or the Lord of the Universe, after this life they will obtain eternal service to the Lord in the spiritual world. Free and concessional parking is available on a first-come basis. Learn more at FestivalofJoyDallas.com or call 214-662-6889. Kalachandji’s vegetarian restaurant has been operated for 36 years by The Texas Krishnas Inc., North Texas affiliate of the International Society for Krishna Consciousness (ISKCON). The society was founded in 1965 by Srila A.C. Bhaktivedanta Swami Prabhupada, who brought the ancient Vedic tradition of bhakti or devotion to the West. The society serves a local congregation of over 5,000 at the Radha Kalachandji Temple, 5430 Gurley Avenue in East Dallas, with daily worship services and classes in meditation, yoga and vegetarian cooking. They also operate the nearby TKG Academy elementary and middle school, and the Food for Life program for the homeless. Founded in 1998, the Crow Museum of Asian Art inspires and promotes learning and dialogue about the arts and cultures of Asia through its exhibitions, the research and preservation of its collections, artistic and educational programming, and visitor experience and engagement. The museum accomplishes this in accordance with the highest professional standards and through collaboration with diverse audiences and community partners within North Texas and throughout the world. Free and open to the public, this museum celebrates the arts and cultures of Asia – from ancient eras to contemporary times—through a variety of permanent and traveling exhibitions that showcase the arts of a multitude of countries. With an array of beautiful spaces and galleries, the museum offers a serene setting for quiet reflection in the heart of the Dallas Arts District. Learn more at crowmuseum.org.